Grant Gilchrist is a Research Scientist with Environment and Climate Change Canada, and an adjunct professor of Carleton University. He conducts research to address federal priorities to conserve Arctic birds and ecosystems. 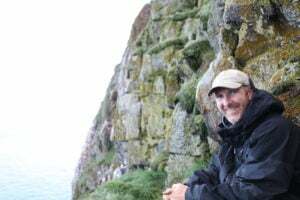 Specifically, he leads multidisciplinary research to provide fundamental insights into the underlying processes of Arctic seabird ecology including their foraging, reproduction, migration, winter distribution and how seabirds are affected by changing climate and emerging diseases in the north. In addition, several projects focus on the harvest of some marine bird species by Inuit because of the importance of ensuring sustainable harvest levels, as well as incorporating Indigenous needs into conservation and management strategies in northern Canada and Greenland. Most of his studies are collaborative and multidisciplinary in nature; linking academia, government, industry and northerners.